Short DEMONSTRATION & DIRECTED DISCOVERY on "Effective use of the Phil’s probe to pierce an electrical wire." Criteria: successfully, without breaking the probe. · HANDOUT - showing the step-by-step use of the probe. · Sample piece of wire. · Instructor shows wire inserted in the piercing probe. · Tie in the importance of using step-by-step dexterity of hand to open probe without damaging it, and close it without undue force. * Demonstrate each step on the handout (see attached handout). * Ask individual students questions about particular steps. * Individual student will be directed through step-by-step process. * Actual student practice will come after the demonstration. * Reemphasize importance of the step-by-step process. * Encourage students to use handout as a guide. 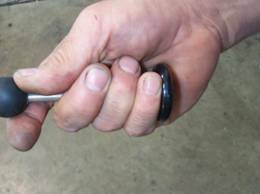 Step 1: Grasp the Phil’s probe with the thumb pressing on the smaller ball and the back of the hand (little finger) pressing against the upper knob. (See illustration below). Step 2: Push gently down on the ball with the thumb, observing the upper movement of the brass shaft and needles to a point above the slot, allowing for insertion of the wire. Step 3: Insert the wire in the slot opened up in the probe. Step 4: Allow the probe to close gently on the wire. 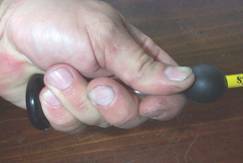 Step 5: Move palm of right hand to upper knob. Step 6: Grasp lower knob with left hand. Step 7: Very gently push down on upper knob. Step 8: Take measurement from wire (hypothetical-we will not be doing this step in class).